Double L's Premier Nursery Floor is a heavy-duty slat engineered for deep hog pit buildings. Its bright lime green color is for easy scour detection and cleaning. 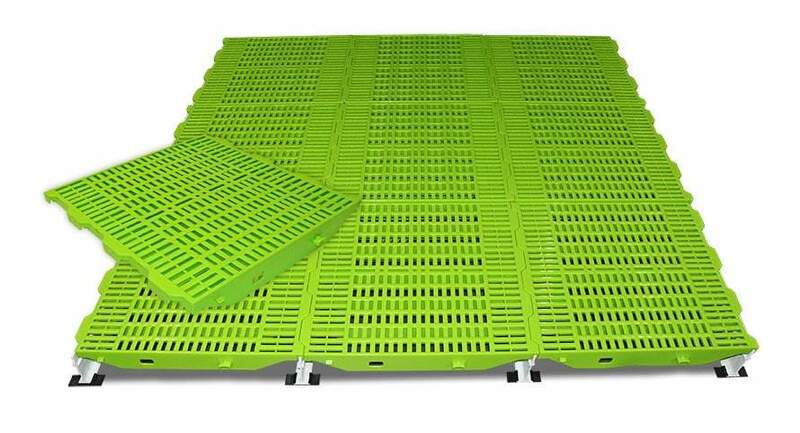 Made of rugged virgin, polypropylene plastic material, the Premier Nursery Floor Slat has a warm surface that does not rob pigs of their body heat and reduces chilling and stress on your pigs. The Premier Nursery Floor's solid plastic construction is rust / corrosion proof and resists bacteria build-up, shedding waste easily. Its prime gap location is great for efficient beam support cleaning. Its 24" x 24" design requires fewer fiberglass support beams than the 18" x 24" competition, which in turn also reduces the cost of installation and quantity of flooring needed. Paired with Double L's 5" PermaBeam, which is the strongest fiberglass beam on the market. 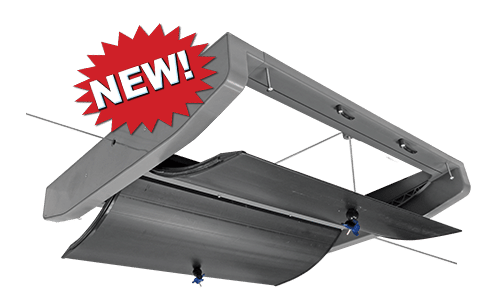 The scientifically engineered PermaBeam fiberglass beam is designed for strength and durability with materials that do not harbor illness-causing bacteria harmful to animal's health. High / low superior traction bars and reinforced deep cross ribs enhance the Premier Nursery Slat strength. The Premier Nursery Floor has a heavy-duty design with impact resistance. Double L's Premier Floor easily snaps together for fast and easy assembly - no special tools required. Its reversible interlocking panels make installation even easier. High / low superior traction bars provide excellent traction for pigs and reinforced deep cross ribs enhance strength. Solid plastic construction resists bacteria build up and sheds waste easily. Pressure washing easily removes manure between slats. Flooring bars run perpendicular for more durability and strength allowing for easy access to support beams for cleaning. Slot openings promote better cleaning and filtration, which protect animal from illness-causing bacteria. Reliable interlocking feature allows for easier and faster installation. Double L's Premier Nursery / Grower Floor is "warm" for little pigs and is designed to reduce the little pigs heat loss. The non-conductive material reduces chilling and stress on the pigs, while reducing the cost of maintaining a comfortable floor temperature. Pigs that are cold and chilled use the feed they eat to keep warm because they do not have any fat; consequently they don't gain any weight. The only heat gain a pig has is through its feed intake. Heat loss, however, comes from a combination of cold structure surfaces, the air temperature, drafts, and the flooring material the pigs are constantly in contact with. The greater the heat loss, the more feed it will take to offset that loss and produce gains. All Filter-Eeze slats from Double L offer the thermal comfort needed for maximum growth and the ability to reduce energy costs. Flooring is a key factor in optimizing the performance of your pigs. 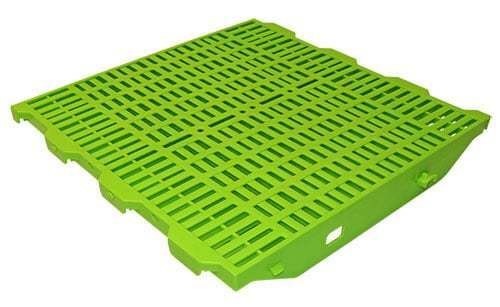 It is important that nursery flooring provides good traction, is durable, readily filters manure, is easy to clean, and has a comfortable surface for your pig. Flooring that is easily cleaned improves labor efficiency. Double L's Premier Nursery Floor keeps little weaned pigs dry, separated from manure, is easy to clean, and reduces pig stress. 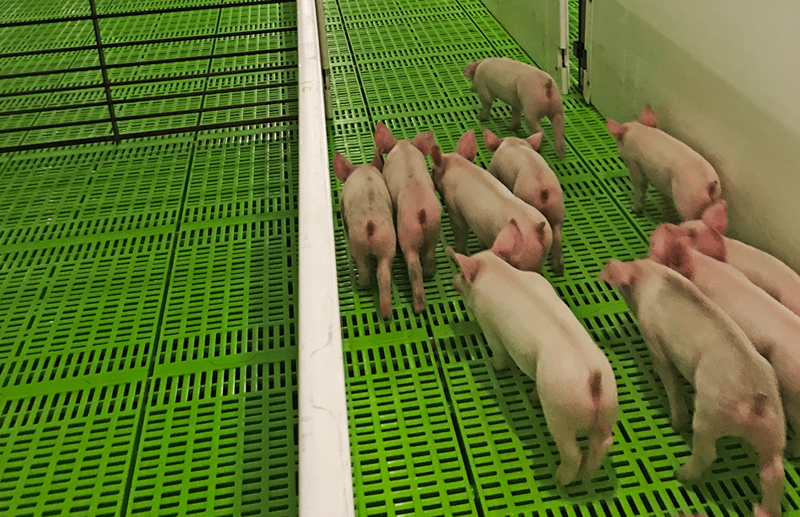 University studies have indicated that pigs on plastic flooring have shown a 15% improvement in their feed to gain ratio compared to metal floors due to less stress on the pig. along ceiling for proper air mixing.